Abi Wilkinson on the ABCs of Labour, and the demographics of political change in 2017. There’s a critique of Labour currently being pushed that goes something like this: the party has abandoned it’s core working class supporters. It gained the biggest swing from voters in NRS social grades ABC1 – commonly used by pollsters as a proxy for “middle class” – while only slightly increasing its vote share amongst C2DEs. The Tories, in contrast, increased their vote amongst the latter demographic. Thus, it’s concluded, the party advocating for a £10 living wage, stronger trade unions and rent control doesn’t really represent working people at all. It has been taken over by privileged, middle-class hippy types who’re out of touch with traditional Labour voters’ true concerns. This is nonsense for a number of different reasons. Most obviously, because of issues with the data being used. NRS social grades were created over 50 years for use by advertisers. The use of ABC1 and C2DE as proxies for, respectively, middle and working class, is based on a distinction between manual work and administrative, managerial or professional roles. For much of the last century, this division made sense. In 2017, though, it leads to some odd conclusions. According to this system, a call centre employee earning £8 an hour doing repetitive tasks with little autonomy is classed as C1, and is consequently understood to be more privileged than a self-employed plumber or electrician making upwards of £40,000 a year. Sociologists first started writing about the “deskilling of white-collar work” and the creation of a “white collar proletariat” several decades ago. It’s unclear why political pollsters insist on sticking with a classification system widely recognised as hopelessly outdated. The other elephant in the room is age. It’s well known that older people were far more likely to vote Conservative in this election, and that under 50s tended towards voting Labour – with this skew being most pronounced amongst 18-24s. There has long been something of an age divide in voting preferences, but it’s now far more significant than it was. There’s no obvious reason this should hinder analysis focused on social class, of course, except for one thing: the NRS social grade system being used classifies the majority of pensioners as E. That is, it groups them in with “casual or lowest grade workers” and “others who depend on the welfare state for their income” to make up the bottom band of the “working class”. When you break down the data by age, a very different picture starts to emerge – and claims that Labour is unappealing to people in working class occupations are far more difficult to sustain. A massive 70% of 18-34s classed as D or E voted for the leftwing party, and 55% of 35-54s in the same category did the same. That’s shop assistants and warehouse workers, bartenders and bus drivers. It’s people at the sharp end of many harmful trends. Zero-hours contracts and other precarious employment arrangements. The decline of trade unions and cuts to legal aid which make it impossible to take workplace rights issues to tribunal. It’s also people who’re unemployed – subject to a cruel regime of sanctions and cuts, including the welfare cap a court recent ruled caused “misery… to no good purpose”. It doesn’t take a genius to work out why these people predominantly voted Labour. The party offered a plethora of concrete proposals to improve the material circumstances of lower income and insecurely employed workers. And though its manifesto was frustratingly vague on certain welfare-related issues – Corbyn has a track record of fighting cuts to both transfer payments and public services. Indeed, his 2015 leadership campaign received a massive boost when he was one of just 48 Labour MPs to rebel and vote against the Conservatives welfare bill, defying caretaker leader Harriet Harman’s instruction to abstain. One likely explanation for the unusually pronounced age divide is property ownership. While the majority of pensioners own their own homes, even younger people earning above average salaries are struggling to get on the housing ladder. This would be less of a problem if the UK had stronger protections for renters, as in Germany and other European countries. As it is, renters are often treated like dirt. The Conservatives voted down a bill requiring landlords make homes “fit for human habitation”, and many people are forced to move because rent hikes make staying in their existing home unaffordable. 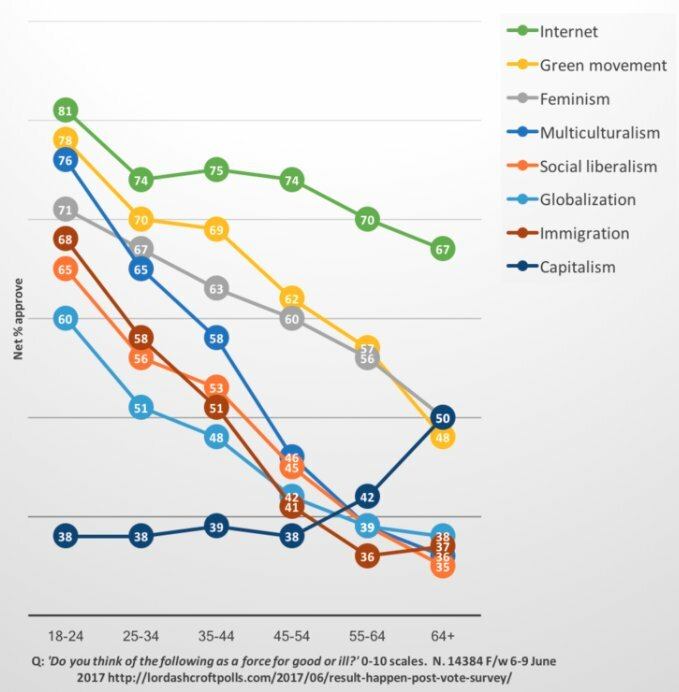 All in all, it’s hardly surprising that younger people are less likely to believe the economic status quo is working and more inclined to vote for the party offering fairly radical change. Usually, narratives about Labour no longer representing working class interests seem to focus entirely on cultural aspects of class identity. A notional white, older, male “skilled manual” worker is held up as the platonic ideal of a working class person the party needs to appeal to – generally by being more hostile towards immigration. In reality, the working class in 21st century is disproportionately female and ethnic minority. Single mothers are hugely over-represented amongst those on the lowest incomes. Working age people are more likely to be living in poverty than pensioners. Amongst all of the demographics most disadvantaged in the current economic context, Labour has made gains, while also picking up middle class votes. The latter trend makes sense when you consider that many professionals have experienced public sector cuts first hand. 68% of teachers voted Labour this time round, for example. In 2010 it was roughly a quarter. The party is building exactly the sort of voting coalition it needs to win – handwringing about “traditional voters” be damned. An article for Bella Inghilterra not Caledonia. We do occasionally look beyond these borders Andy. No bad thing I think? It’s important to track the wider shifts in UK politics which may well have an impact on the dynamics of voting patterns in Scotland too, even if there are different circumstances. Andy makes a valid point, in that the article ignores specific dynamics affecting Scotland, which are influenced by factors beyond class or wage levels, or even age. Here the recent GE vote, driven by the unionist msm, was largely about either “vote Britain” (i.e. vote for any unionist party with best chance of ‘stopping the SNP’) or ‘vote Scotland’ (i.e. SNP). In this context arguably the biggest influence now affecting voting in Scotland is population change, i.e. reflecting the dominant cultural orientation of each population group. Over to the census. The census tells us that the over 1 million people have come to live in Scotland from rest-UK over the past 20 years, and voting intention surveys at indyref1 suggested 80% or more of them were No voters (i.e. about twice the likelihood of Scots to vote No). Culturally these people are therefore predominantly No voters. The census trends also tell us that another half million or more people will come to live in Scotland from rest-UK in the 2014-2024 period, thereby replenishing the No vote further. Arguably this particular population change probably represents the biggest threat to independence, and it also provides evidence that the voting dymanics of Scotland are vastly different from the rest-UK. Clearly the author of this article is unaware of these specific dynamics. Andy’s point is valid if – and only if – the reader is exclusively interested in Scottish politics and assumes that Scottish politics is hermetically sealed to influences from the rest of the UK and wider world. The issues you raise are very valid, but this doesn’t invalidate the analysis presented by Abi. Bottom line is, in the next indyref, assuming us Jocks are allowed one by our colonial maisters, almost 50% of No voters will be people from rest-UK. What would the UN Committee for decolonization say about that? Perhaps the SNP should reconsider who has the franchise? Why o why do landlords need to own homes so they can rent them out. I couldn’t sleep at night knowing I was committed to forever paying rent. Think of it like that and one can understand why folks want to buy their house and own an asset. >>Why, o, why do people need to :own: their own homes ? To stop paying rent. Right now, (*if* you can afford the deposit), paying a mortgage is cheaper than paying rent to a private landlord. And the cheaper the house, the bigger the gap between rents and mortgages. Spotted the family house I sold 20 yrs ago for £122k on sale again for £320k. It has gone up by just less than 5% compound pa compared to inflation at 2.8%. But…..to add to Craig P’s point. In 1997 the mortgage would have been £901 per month for £122k and today a £320k mortgage is £1,350, which is only £790 at 1997 prices. The high price of the house coupled with the low mortgage % means that the monthly payments are not out of line compared to historical norms. The problem is getting the deposit together. So do you feel more upper class than someone who maybe says ” I am always between jobs , so maybe now is not the time to buy” so I WILL JUST RENT ……………I there something of a stigma ? To all above – there’s a world of difference between community renting and private renting. Abi Wilkinson has done a good service by providing this analysis. We would rarely get something like this in the main stream media. We often have to go to academic and similar journals and to official data. As Abi Williamson has shown by framing the analyses differently we can get different insights. Having had to pore through data during my working years, most social issues are complex and multivariate and usually have to be presented in a range of ways in order to draw what are, often, fairly tentative conclusions. But such conclusions are much more valid that the mendacious misuse of statistics which the mainstream media use. One of my “indy-undecided” friends recently asked me if the resurgence of Labour in England would make me think twice about the need for an independent Scotland. Perhaps, he suggested, the whole country is now moving leftwards and we can enjoy a united & more socially just UK in the future? I’m not convinced. The UK seems to ping-pong between left-right governments over time with the long term drift being rightwards (e.g. Blair ism). Whomever is in power in Westminster, Scotland will be a minor concern to them and will always be sacrificed for the greater (south/mid England) good. Corbyn doesn’t “get” Scotland at all. If England moves leftwards and elects a more socialist government, that’s great. I still want to live in a real, democratic country which puts its citizen’s well-being & health first, above corporate/elite wealth. We will never get that with a London government but we do have a chance with independence. Well, the influx of other UK residents over the last decade, and the decade to come, is an uncomfortable issue for Scottish progressives, that is not really debated in polite company. Put bluntly, it is partly a racial issue, partly a cultural issue, and partly a national identity issue. It is also a part of the Globalisation process. The “Incomers” are 80% Unionist. They are from a right wing, Unionist society, from the country next door. They bring with them a lot of baggage, most of it bad. They are overwhelmingly Anglo-Saxon in racial identity, raised in a reactionary society that has inculcated in them from birth that WASPS, (White Anglo-Saxon Protestants) are the Uber-class and racial group. They are full of an unconcious racism, (in the best case) or open racism, (in the worst case) that devalues all things identified as “Celtic”, from the language and culture, to the nature of Scottish society itself. Even those “Incomers” who arrive with liberal pretensions, are actually, deep down, imbued with a deep racial sense of superiority. It does not help that these are the elements of mostly the English middle class, who have the financial mobility to establish themselves in Scotland, but expect to be allowed to import all the English attitudes that give them a “Comfort zone” buffer against the local Scots. They are “Cherry-pickers”, expecting to absorb the benefits of Scotland, whilst having, to a greater or lesser extent, a “White-Settler” mentality. Wales is also full of these people. It is pure selfishness, and self interest. They also like the feelings of social and cultural superiority and difference that living in Scotland with these attitudes gives them. They import, wholesale, the cultural mentality of the English middle and upper class, and its class system. They are then offended when the local Scots object to their presence and behaviour. The classic example is the English “Incomer”, who cashes up their house in London, buys substantial land and property in the highlands and Islands, then objects to the locals erecting Gaelic road signs, and tries to get them stopped. (really, this happens all the time). Any manifestation of local and national identity makes them uncomfortable. The writer Franz Fanon set all this out very well in his classic book, “Black Skins, White Masks”. As a substantial portion of the Scots population have been completely infected by an induced “Scottish cringe” and go along with this. To say all this, as I am, is to break some very strong Taboos of the liberal intelligentsia, (which itself is strongly anglicised.). This is a poisonous mix and brew. It is real, and it is not properly debated and discussed. It is simply excluded from the debate about Scottish national identity. To be fair, there is another kind of Anglo immigrant to Scotland, that is the 20% of the Anglo’s who voted YES. These are a different kind altogether. They have moved to Scotland precisely for the things that the mainstream Anglo community in Scotland hate. They actually like the culture, the history, the landscape, the social structure of Scotland. Paradoxicly, they came to Scotland, to get away from the toxic English class and social system, and to live somewhere where it does not exist. They then find a substantial minority ethnic and national group, akin to the “Unionist Community” in Northern Ireland, that they “Moved up” to get away from, here. So the Anglo community in Scotland is a divided one. So is the Scottish ethnic and social community, that has a large section of cringers and “Assimulated” people in it, who are almost ashamed of being Scots. The Scottish Tory party is full of them. So is the Scottish “Labour” party. What I have now drawn here is a sort of rough ethnic cultural and political map of Scotland, that does not look at all like the official one. Until these issues are faced, accepted, and dealt with, by nationalists, there is every danger that Scotland is going to resemble the Baltic States under Soviet occupation, eventually. The Indy referendum was lost by 400,000 votes. 600,000 from the “Anglo” community voted no. Another 300,000 from the next wave of Anglo-migration are going to do the same. So Scotland is being “Russified”, and assimulated into the Anglo/UK identity. This harsh reality has got to be faced. it cannot be ignored. What to do about it is another matter, but actually facing reality, and debating it, would be a very good start. I am in no way a racist. In fact, I am an Irish citizen, who deeply values the Celtic identity and culture. I am also an internationalist, but one who looks at the reality of things. Discuss!. You have hit the nail squarely on the head!! This is a huge issue and a major stumbling block to becoming an independent country. A brilliant synopsis Graham. During her recent lecture at Stanford University, Nicola Sturgeon was asked why the voting franchise in the referendum was extended to everyone who lived in Scotland no matter where they were from or how long they had been here, and was not limited as in most other nations primarily to those only born in/or with parentage in a country, especially on constitutional matters. The FM’s answer was more or less to the effect that this “would be too difficult to do”. That answer reminded me of the ‘Yes Minister’ comedy programme, where senior civil servants would inform Ministers of ‘serious impediments’ (usually exaggerated) on any policy they did no like. As it happens, most of the Scottish Government’s senior civil servants are sent to us from Whitehall, and many are not Scots, as with most of Scotland’s senior institutional positions, so one gets to understand why the ‘open franchise’ was preferred by them. But the wider point here that Scotland appears to be experiencing a more concentrated process of colonization needs to be discussed, and it should not be forgotten either that the UN has a permanent committee dealing with what it calls “the scourge of colonization”, and which the UN calls on member states to end. To a large extent independence and decolonization are one and the same thing, as the evidence of Westminster’s treatment of Scotland’s democratic voice becomes ever clearer. I like Scotland as Scotland although i dont live there. However i recall an interactiin over a week between three young men. Onecwith a strong estuarine accent and 2 glaswegian lads. On a week of voluntary work peaking weeds in a hospice gardens, there was evening chat and camraderie. Except the essex lad whinged the refrain, in broad essex speak ” i cont andersteaand a word es sayin”. The glaswegian lads responded by upping the brogue from 3 to 7 and sometimes 8 whuch was quite fun to watch and decode. I used to decoding as i’m a brummy and to the north of burmingham is the black country which is like a kind of super brummy. When i lived in london for a dozen years, i went visit my brother in wolverhampton. I asked this lad from my motorbike, engine still running, near my brothers if thete was a pharmacy nearby. The lad replied innwhat i can only describe as something that could have been Swaheli for all the intelligibility of it. As i sat on the bike puzzling the accompany gestures, the lingua gradually revealed utself to my southernified ear. And in fact tge lad had given me a simple and clear set of directions” maybe the best i ever received, once your ear had the key to the accent. God bless the black country. 🙂 Aarrrrrhhh owa kid. I understand the concern, but to try to disenfranchise those born outwith Scotland would be poisonous. One of the best things about the SNP has been its firm stance on civic nationalism: if you live here you have an equal say in the country’s future. One of the worst things has been the attitude of a minority of SNP supporters expressing a more racist ethnic nationalism. And it’s definitely counter-productive: if you make incomers unwelcome, they’ll vote No next time. The way to win over incomers is to emphasize the civic nationalism ideal. On the contrary, “racist ethnic nationalism” is best illustrated by those who come from rest-UK to live here yet actively seek to subvert self-determination and decolonization for Scots by voting No. They will also vote No next time, their British culture is too strong to do otherwise. They have little or no concept of, or interest in, Scottish nationhood; indeed they view Scottish nationhood as a threat to their Britishness, and quite rightly so, as without Scotland there can be no British state. I would suggest you read Graham’s post again as you clearly don’t ‘get’ who the nationalists are here. If I wanted a state that denied votes to people on the basis of where they were born and their suspect divided loyalties I’ve already got the British state; why bother with independence then? The UN decision “to end the scourge of colonization” is clear, as is the need for nations to adopt strategies necessary to bring about decolonization (e.g. via the voting franchise); failure to adequately deal with this means that Scotland will probably always be ruled by the British state, and the Scottish people will never achieve self-determination (i.e. independence/decolonization). Scotland is not being colonised by “English white settlers” and your apparent obsession with ethnicity as a basis for nationhood is a nasty 19th century throwback no matter how you try and dress it in the language of Fanon and liberation struggles. All you’re presenting me with is a poorly-photocopied pre-GE Theresa May: no to immigration, if you’re not born here you’re a citizen of nowhere; and railing against internal wreckers. Or perhaps you have another definition to hand? You’re asserting that we’re being occupied and under political control by some nebulous Anglo conspiracy. Not only is it utter pish but you’re using that to push political positions that reek of far right entryism. Words such as “Seems” and “arguably” are used intentionally by me to give you the opportunity to argue otherwise, i.e. that Scotland does not exhibit the characteristics of a colonised territory, based on any evidence you may have to substantiate this. “Arguably” you don’t “seem” to have any evidence to substantiate your opposition to my statements, which perhaps explains why you revert to hyperbole. I agree with milgram and i’m disappointed that mr Baird’s xenophobic and culturally isolationist nonsense isn’ opposed more strongly on this site. To be clear on one thing though, Mr Baird is deliberately misrepresenting the demographic data. As at now there are not much more than 600,000 rUK born residents in Scotland. And there is no evidence that this number is rising at the rate claimed by Mr Baird. according to NRS own data, E is *state pensioners* not just pensioners; i.e. those who do not have other sources of income. I think the cat amongst the pigeons is part time work whereby one may get parts of a week of work and rest may be difficult to fill. A junior Msc or phd holder may nominally receive 30k pa pro rata but pro rata this could turn out to be 18k pa if their contract is only for 3 days a week. 25% of the uk is employed on a part time basis. Many economic analysis only cite ft employees. This biases the true picture up. It alwats surprises me how liberal labour voters became over time. It was a convenience for the new labour elite as on the job vocational training by companies disappeared when a sea of already labour was available from.abroad. of course tge consequences of a 10% rise in the population was a greater draw on state and commercial resources witjout a commensurate compensation to provision of the underlying infrastructure. A levy on employers for additonal cost incurred on society through their deciding to use immigrant rather than resident labour of skilling the resident population and building extra capacity in housing, schooling, transport, communications and welfare would help correct the drop in quality of life incurred to date and better reflect the true cost of choosing to employ mass immigrant labour.